Bevel or pantah twin for Ahrma racing? Hope this isn't a repost. 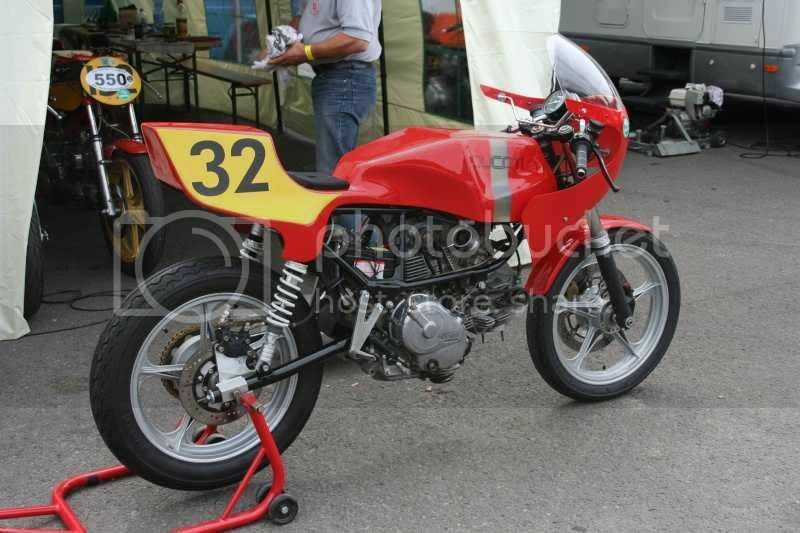 I got into ahrma road racing a couple years ago, first with an aprilia rs250 and now with '05 Ducati 800SS. Since it's mostly a vintage racing club I'm getting the itch to put together an older Ducati twin to go along with my newer one if I can afford it. The trick is to pick one that fits into one of ahrma's classes. My '78 darmah 900 only fits one class and it has to compete with 1000cc 4 cylinders up to 1982. I don't wanna convert that bike to a racer anyway because it makes a nice street bike. Spring valve 750's are legal in four classes but I hardly ever see them at the races. Kinda strange since they were popular race bikes when they were new. Did not many survive? I'd like to start with a rough 750 gt or sport and build/restore it into a racer but project bikes for these seem to be hard to come by. Are any still out there? I wouldn't care if expensive bits like the aprilia headlight and borrani rims were missing. What price range would bikes in that condition be worth? The 100pt concours restorations are too rich for my blood and I wouldn't want beat one of those up on the track. Another option is the straight head pantah engines like the 650sl, cagiva alazzurra or 750F1 in the vintage superbike middleweight class. The cagiva is much cheaper than the bevels but nowhere near as cool IMO. anybody out there have good luck racing them? Re: Bevel or pantah twin for Ahrma racing? BultacoConvert wrote: Spring valve 750's are legal in four classes, but I hardly ever see them at the races. Too rare, too expensive, too slow ..
650SL and F1: too rare, too expensive. The alazzurra seems like a good option. That engine might even have some parts in common with my 800SS, which is always convenient when racing two bikes. Those TT2 replicas look pretty nice! I saw some authentic ones at the Barber vintage festival a few years ago. I'm surprised to hear the 750 springers are slow? I was thinking in Sport trim they wouldn't need much hot rodding to compete with the British bikes in those classes. Anyway I'll be on the lookout for a cagiva.